The 14th episode of the sixth season of The Walking Dead, “Twice as Far,” began in a loop, illustrating to us that, after killing off what they believed to be all the Saviors, Alexandria had returned to a peaceful routine. On The Walking Dead, however, routine never lasts for long. There will always be others who want what they have. In this case, those others are still The Saviors, with Daryl’s old friend Dwight among them. Dwight killing Denise (borrowing a scene straight out of Abraham’s comic arc) was the final straw for Carol. As the episode came to its conclusion, Carol had left Alexandria and Morgan stared off into the distance, looking guilty for his role in Carol’s departure. With two episodes to go this season, we have several questions about last night’s episode. 1. What will Morgan’s jail cell be used for? “Why?” Rick asked of Morgan, when he saw that he’d completed building his jail cell. “It’ll give us some choices next time,” Morgan told him. 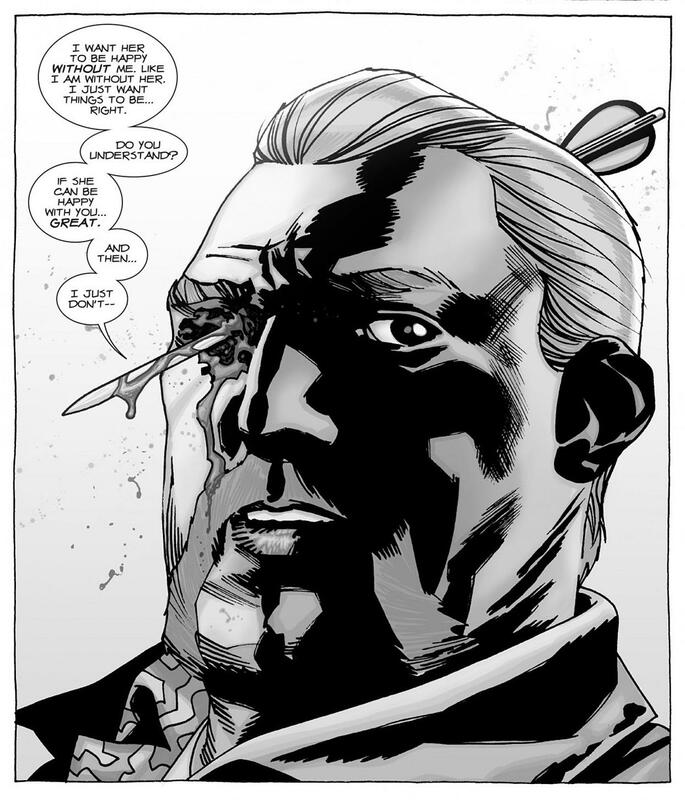 That next time will almost certainly involve Negan, and if Negan is not ultimately killed in his showdown with Rick, maybe Morgan can use that jail cell to transform Negan into a peaceful, productive member of Alexandria. Stranger things have happened, right? It also gives Morgan some utility in the show moving ahead, and puts a button on Morgan’s flashback origins story with the cheesemaker. Either that, or like the cheesemaker Eastman, Morgan plans to use the jail cell to starve a man to death over 47 days. 2. Where have we seen this figure before? 3. What’s cooking between Rosita and Spencer?